This past Saturday I was asked to do a very special photoshoot. This shoot took place at the Sacramento animal shelter on Bradshaw Road and had the purpose of helping their animals get adopted. The shelter has a lot of animals on site for adoption - and all these animals need good homes, so hopefully some of the photographs we took this past weekend would be able to bring some awareness to the shelter in a fun way. 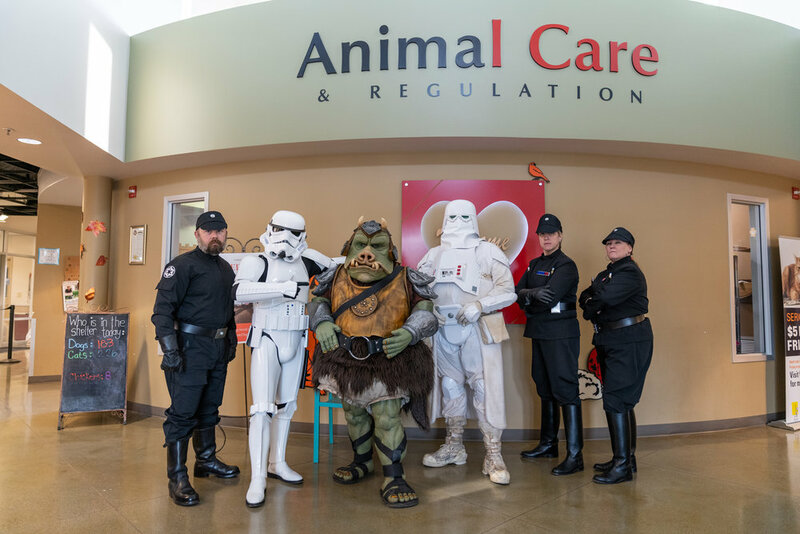 The photoshoot involved having the animals pose with Star Wars cosplayers. I have actually done this for a few years now, and it’s always a blast. We’ve done comic heroes and other themes before, but this year was Star Wars. The cosplayers looked great, and the photos with them and the animals would be a sweet combination. The Gamorrean Guard from Jabba’s Palace was probably my favorite looking cosplay of the entire day. He looked finely detailed - as if he just walked right out of the movie screen! I shot a many photos with him and different animals, but this shot was my favorite of them all. It really looks like the Gamorrean Guard has a soft spot for this little feline! The most unique animal of the day was this large chicken. He was quite a site to see when they brought him in to be photographed. This big guy was a big scared and did a big poop on this Imperial commander as he held him. I guess that’s better than having to face Darth Vader for making a mistake! Most of the photographs were in full color with some editing to make the background pure black. Some shots wouldn’t work in that fashion so I decided to do some selective color for those particular images. I’m not the biggest fan of selective color, but I think it works well in this case to highlight the animal. When we were all done with the shoot, the cosplayers got to walk around the shelter and take photos with the kids and families that were there that day checking out animals. We got to have a little fun as well and put our big Gamorrean in his own cage. I’m sure someone will adopt him real quick. I had a wonderful time photographing the animals and the cosplayers. If you’re at all interested in adopting an animal, please consider going to the Bradshaw Animal Shelter. It’s a great facility, and I’m sure there will be a special animal just for you when you go! If you’d like to see all the photos from this event, CLICK HERE to go to my dedicated cosplay site.